DECEMBER 1--Here is the felony criminal complaint filed today against football star Plaxico Burress, who shot himself in the leg early Saturday at a New York nightspot. The New York Giants wide receiver, charged with criminal possession of a weapon, appeared briefly this afternoon in Manhattan Criminal Court, where a judge set bail at $100,000. 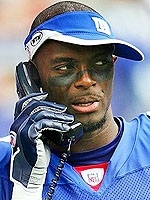 Burress, 31, was injured when his weapon--which was tucked into his waistband--somehow discharged inside the Latin Quarter nightclub, where he had gone to party with teammates. Following the shooting, Burress declined to call police, opting instead for treatment at a Manhattan hospital, where he reportedly used an alias and claimed that the accidental shooting occurred at an Applebee's. Are You Ready For Some Mug Shots?